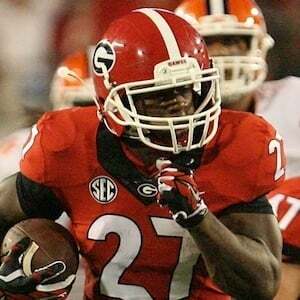 Running back for the University of Georgia Bulldogs who was a first-team All-SEC selection during his freshman season in 2014. He was selected in the second round of the 2018 NFL draft by the Cleveland Browns. He was recruited out of Cedartown High School where he played football and ran track. He was ranked as a four-star recruit by both Rivals and Scout. He helped Georgia reach the 2017 NCAA Championship game. He was born in Cedartown, Georgia. He has siblings, Zach and Neidra. He started in place of Todd Gurley after Gurley was hit with a suspension in 2014.